RAY CITY- For the first time in the history of Ray City, a woman has been elected as the mayor. Juanelle Wilson was sworn into office at City Hall by City Clerk Betty Shearl Jan. 7. She is excited about her election. “I was pleased to know people wanted me and supported me,” she said. Mrs. Wilson, wife of Don A. Wilson, isn’t a newcomer to the political arena. 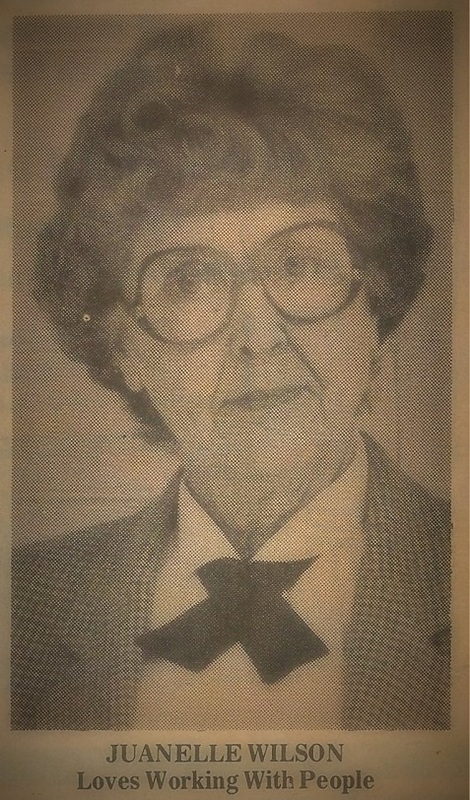 She ran for the Ray City mayor’s office unsuccessfully three times, the first being in 1973. 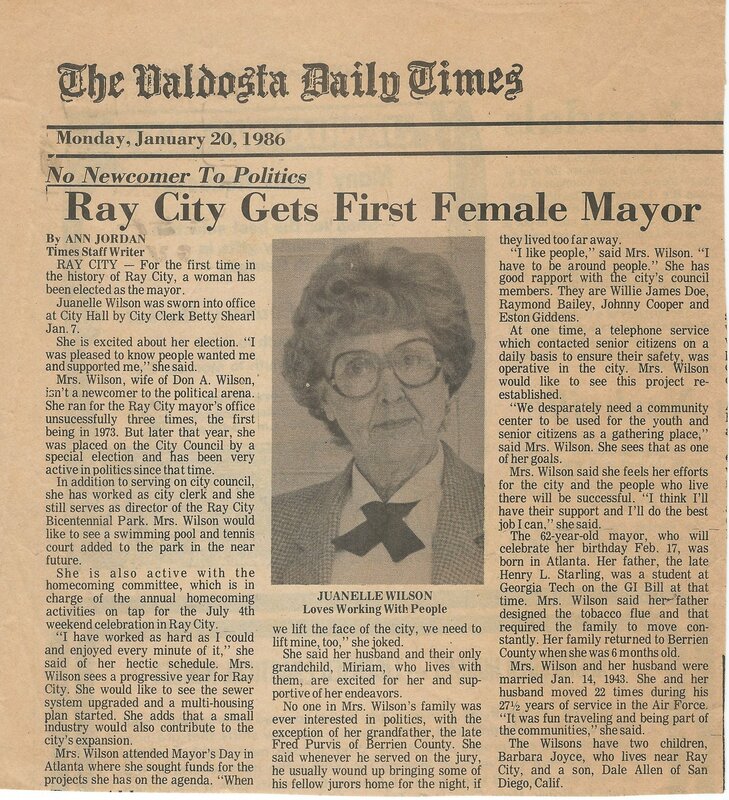 But later that year she was placed on the City Council by a special election and has been very active in politics since that time. In addition to serving on city council, she has worked as city clerk and she still serves as director of the Ray City Bicentennial Park. Mrs. Wilson would like to see a swimming pool and tennis court added to the park in the near future. She is also active with the homecoming committee, which is in charge of annual homecoming activities on tap for the July 4th weekend celebration in Ray City. “I have worked as hard as I could and enjoyed every minute of it,” she said of her hectic schedule. Mrs. Wilson sees a progressive year for Ray City. She would like to see the sewer system upgraded and a multi-housing plan started. She adds that a small industry would also contribute to the city’s expansion. Mrs. Wilson attended Mayor’s Day in Atlanta where she sought funds for the projects she has on the agenda. “When we lift the face of the city, we need to lift mine, too,” she joked. She said her husband and their only grandchild, Miriam, who lives with them, are excited for her and supportive of her endeavors. No one in Mrs. Wilson’s family was ever interested in politics, with the exception of her grandfather, the late Fred Purvis of Berrien County. She said whenever he served on the jury, he usually would up bringing some of his fellow jurors home for the night, if they lived too far away. “I like people,” said Mrs. Wilson. “I have to be around people.” She has good rapport with the city’s council members. They are Willie James Doe, Raymond Bailey, Johnny Cooper and Eston Giddens. At one time, a telephone service which contacted senior citizens on a daily basis to ensure their safety, was operative in the city. Mrs. Wilson would like to see this project re-established. “We desperately need a community center to be used for the youth and senior citizens as a gathering place,” said Mrs. Wilson. She sees that as one of her goals. Mrs.Wilson said she feels her efforts for the city and the people who live there will be successful. “I think I’ll have their support and I’ll do the best job I can,” she said. The 62-year-old mayor, who will celebrate her birthday Feb. 17, was born in Atlanta. Her father, the late Henry L. Starling, was a student of Georgia Tech on the GI Bill at that time. Mrs. Wilson said her father designed the tobacco flue and that required her family to move constantly. Her family returned to Berrien County when she was 6 months old. Mrs. Wilson and her husband were married on Jan. 14, 1943. She and her husband move 22 time during his 27 1/2 years of service in the Air Force. “It was fun traveling and being part of the communities,” she said. The Wilsons have two children, Barbara Joyce, who lives near Ray City, and a son, Dale Allen of San Diego, Calif.